So I loved my call, KI4FH. It has been with me for well over 20 years. Yet, I wanted a change. 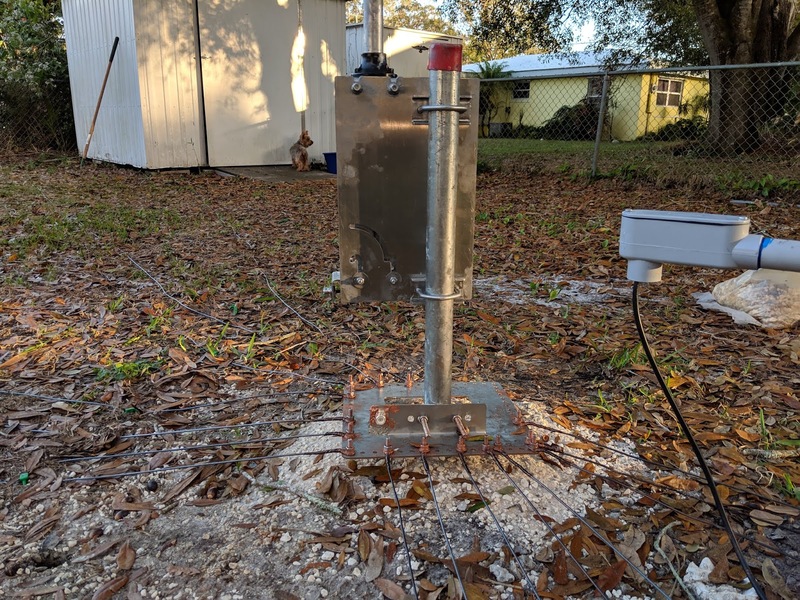 I noticed that K4SRQ was up for grabs. SRQ being quite popular here in Sarasota as the airport id for our local regional/semi-national airport. So, I dropped KI4FH and am now K4SRQ. It is a vanity call. It expired in 2016 and was held by an SK that was quite the educator and loved the Lord. That was enough for me to take on the mantle of the call. So it is done. 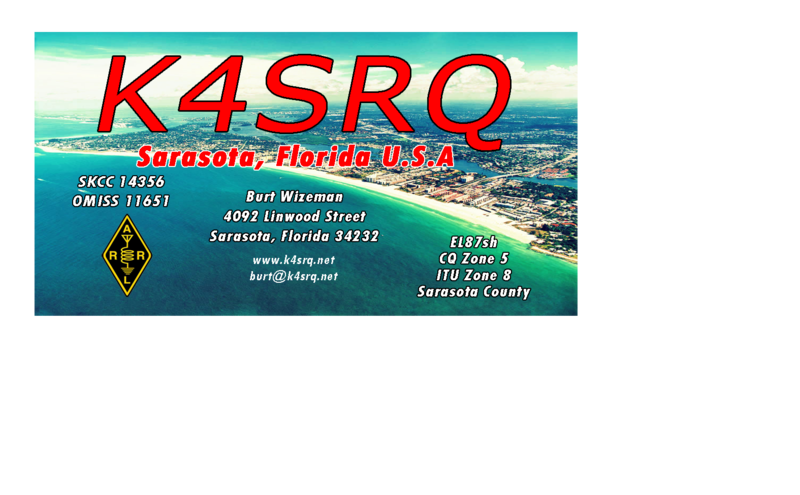 K4SRQ is the call for now and in the future. So we moved a lot in 2017. 3 times! Three times we packed our goodies and moved to a new location. Yes, we purged along the way. Got rid of lots of junk. We went through a lot of junk too. The good kind, the kind of junk that builds character, strengthens families and deepens ones reliance on our Lord. The other junk, the stuff we got rid of, built dust, mildew and opportunities to trip. I picked up a Hustler 4BTV and installed it at our former QTH. The pics are in a previous post. We remained at that QTH for several years and it was within 2016-2017 that we made three moves in a 12 month period.. The 4BTV was packed away along with the rest of the shack. 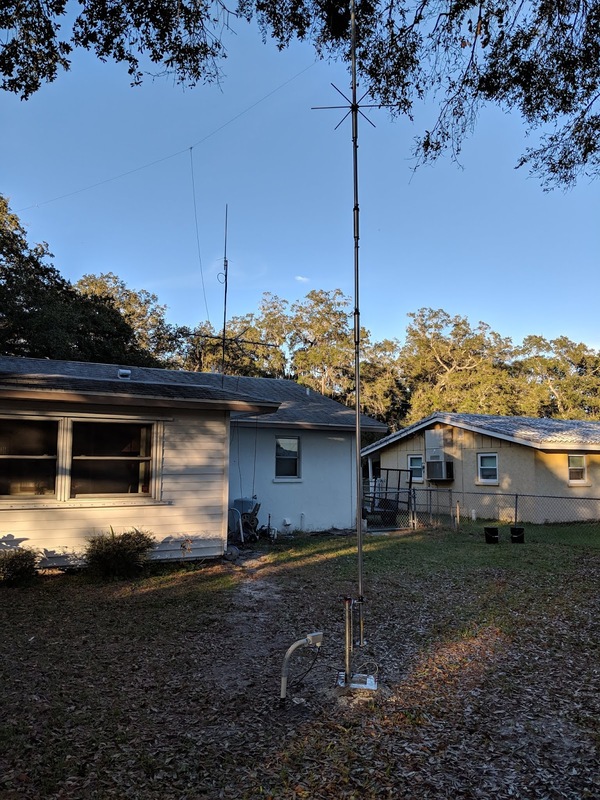 Since we were condo bound for a while, I acquired a FT-817D for portable use at a nearby park. It worked ok, I had a few QSO’s but it was not as much fun being my only rig. After our third move landed us at the current and final QTH, we spent a year readjusting. It takes time. I bought the Icom IC-7100 shack in a box and I put up a few dipoles and a G5RV, setting up the shack in the garage. 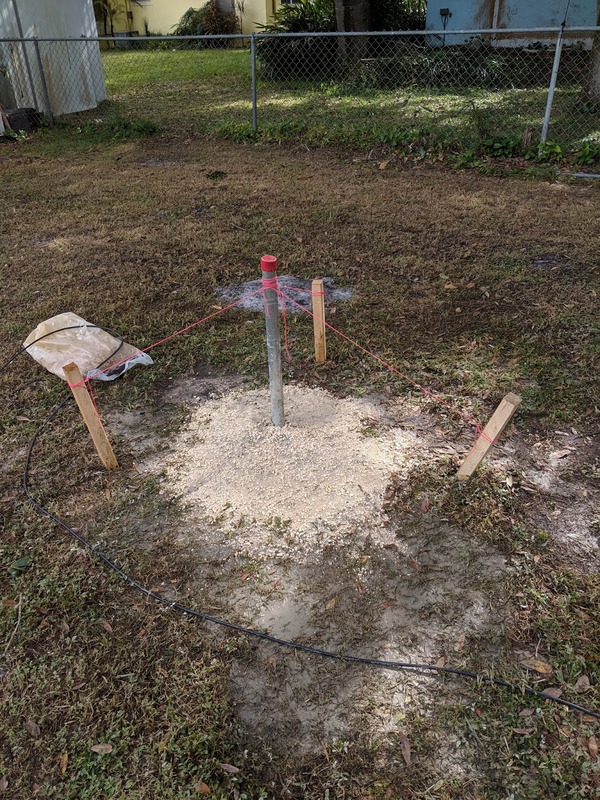 Since we moved into this QTH January the 17th of last year, it has been almost a year to get the 4BTV in the ground. I followed the DX Engineering installation instructions. I acquired the radial plate and tilt base. I cleaned off all the corrosion on the antenna, replaced the screws and properly attached the coax to the antenna. It was a lengthy but rewarding installation. 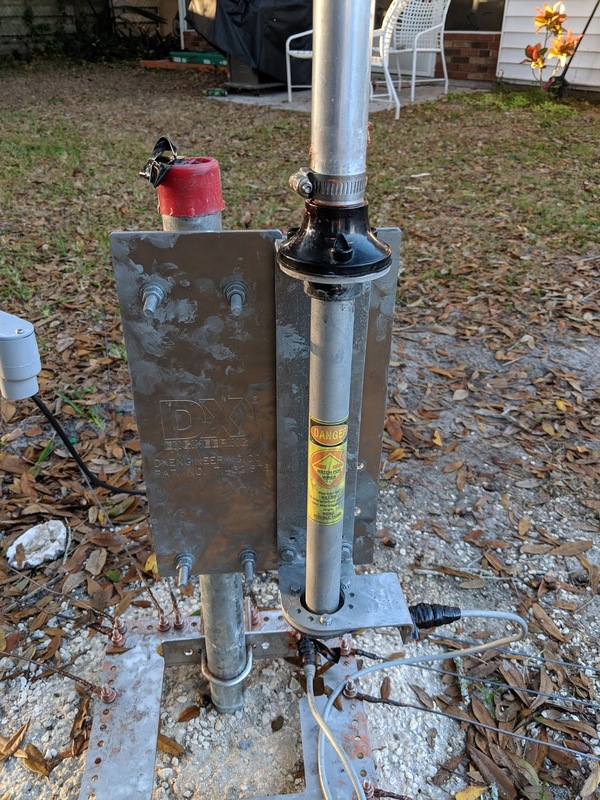 Here are a few pointers to consider when installing an xBTV vertical following the DX Engineering instructions. 1. Plan out each step you are going to take. 2. Install the SO239 Bulk Head connector onto the radial plate before installing it. Easier doing it on the bench! 1. Prepare the ground radials. I used #14 Twisted THHN coated wire. I got it at Home Depot for around 36.00/500 feet. Radials on the ground do not need to be tuned. 2. I acquired 16-14 Gauge High Temp Ring Terminal with a 1/4:” Stud (Hole) from by Morris by Amazon to make the terminals that go onto the ¼” Stainless Steel bolts from DX. Crimp and Solder, flows nice. This is a dissimilar metal to the Stainless so you will need the Anti-Seize of your choice. 3. Dig your Trench for the burying of the Coax. 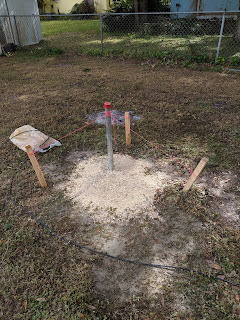 The Coax should be underground by 8” or more to keep from possible interaction with the radials. 4. 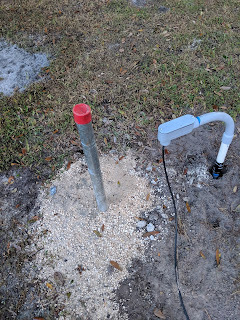 Plant the PVC pipes that your coax will run through. I had to use both Sched 40 and Electrical bent PVC to do the job. You will want to come out of the ground with a candy-cane curve to the top of your pipe at both ends. 5. Run the Coax through the pipe. 6. 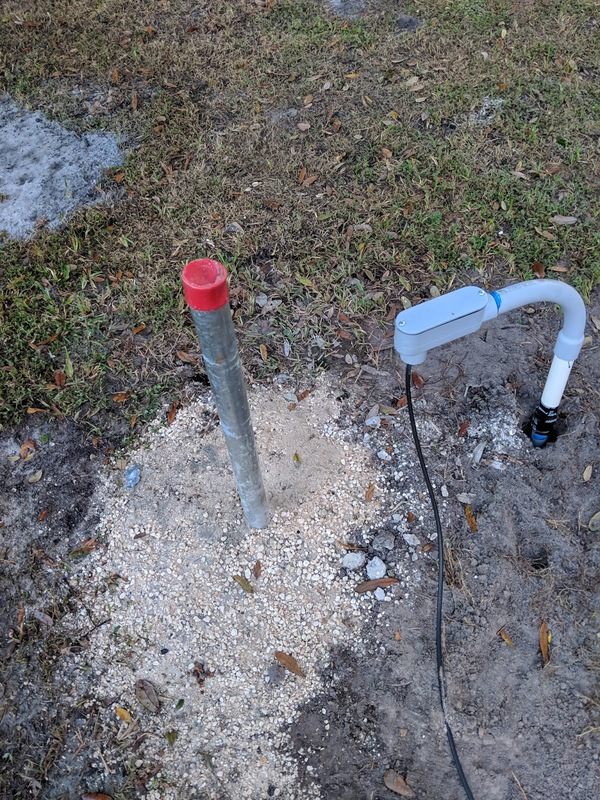 Plant your 1 ¾” Galvanized Pipe into the ground with concrete. Don’t use an aluminum pipe. 8. Mount the Radial Plate. Have the Coax side opposite the side that you will be mounting the Tilt Base on. Look at the pictures supplied by DXE. The antenna will tilt to the right if you are facing the plate. 9. Install the Spider on the 4BTV. 10. Construct the Antenna. Put the bottom tube on the Tilt Base so that you can easily install and control the antenna during construction. 11. Lay down your Radial wires and connect to the antenna Radial Plate. I used biodegradable garden spikes from Amazon to hold the wires down long enough for the grass to do its work. 12. Attach the Coax cables. 13. Now tweak the antenna. I found that using the suggested measurements worked fine. I find this antenna noisier than my tuned dipole but that is to be expected. It does work great and for limited space multiband you can’t go wrong. With the Tilt Base, it is a one-man job. Full time to install was around 15 hours, including bumps along the way. The Trench. About a foot deep. 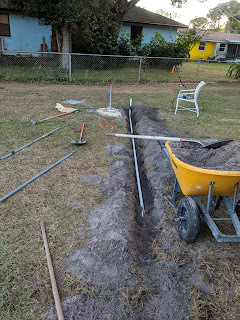 will make keep the pipe straight and level. Pipe planted, PVC buried and Coax run. Radials, Radial Plate, Tilt Base and Anti-Seize on connectors. Tilt Base Front view. Smudges are aluminum anti-seize to be cleaned off. but gain a bit more room for the antenna. Over the past few weeks there has been a lot of activity in the shack with little focus for air time. I have been getting to know the trees and branches on the property, figuring out the best position for a new Dipole. 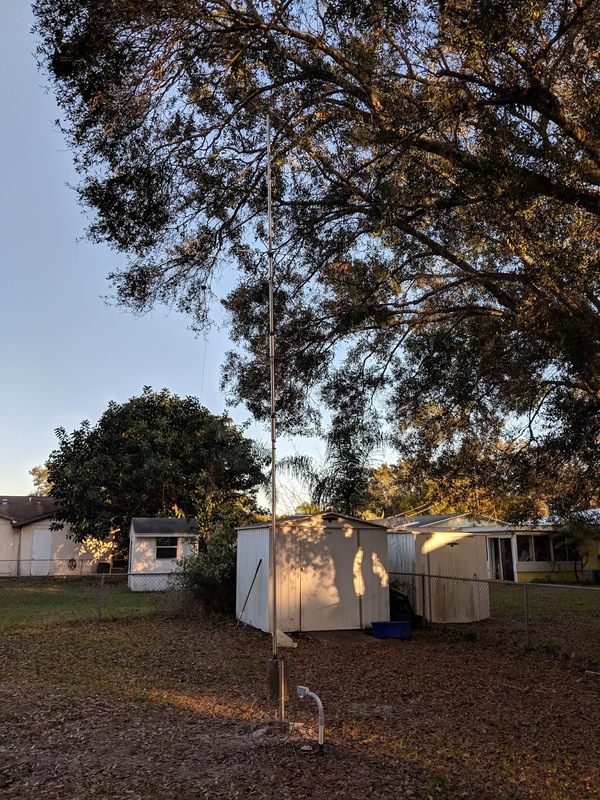 Once I stepped back I realized I needed a half way decent multiband antenna. 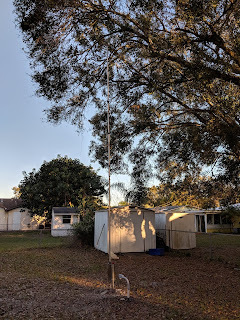 The problem with a decent multiband is that my lot, diagonal, measures 132 feet. Straight line front to back is 104 feet. I ma blessed with several trees, up about 45 feet tops. I settled on a G5RV but where to fit it was the problem. After getting a stiff neck looking up at the trees contemplating the least invasive, least error prone locations, I took a chance on an inverted V configuration in my back yard. My wulfhung is an 8oz plumb bob which has proven to be a great way to get a wire up, once you get the hang of it. I found a nice hole in the branches that only has a few leaves touching the 450 Ohm ladder line that forms the 31.5 foot feedline. So far, as of today, it is working on one of the worst days for HF this summer. I am hearing the International Bible Study Net on 14.32250 and the ant appears to be staying true to its form by providing an omni directional pattern. I sold a scanner and picked up an Ameritron RS8V Remote Coax Switch which makes my wife a happy person by not having 4 or 5 holes in the wall! This is a link to the pdf that will provide all the info you need to make your own fun, effective and afforable end fed that is easily tuned. Roll it up and take it with you for portable operation or up and down for the dreaded deed restrictions from your HOA.